Stamping Sara: What do you make when you have one day's notice before a Halloween party? What do you make when you have one day's notice before a Halloween party? 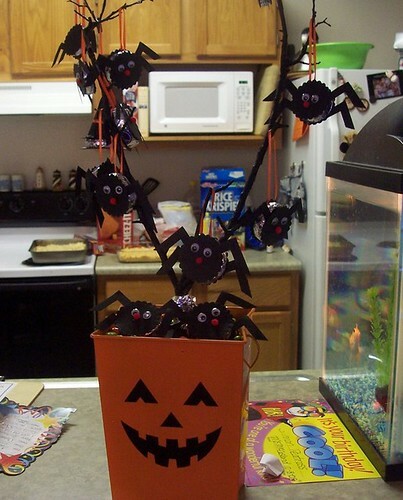 Why peppermint patty spiders on a tree and rice krispie treats of course! A friend of ours called last night and invited the kids to an impromptu Halloween sleepover. I know she has to work so I volunteered to make something for the party. I wanted something cute but quick. 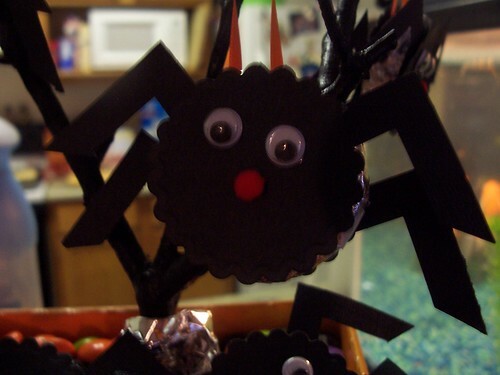 I chose to make the peppermint patty spiders I've seen on the internet lately. On one blog she had hanged the spiders on a tree branch (I don't remember who to link to). Supplies: Spellbinders scalloped circles, Photo corner punch, black paper, googly eyes, red pom poms, ribbon, bucket from the dollar spot at Target. What a fantastic idea....they are adorable. SOmeone put those spiders up on the MB. Robots in Space birthday party is a success.